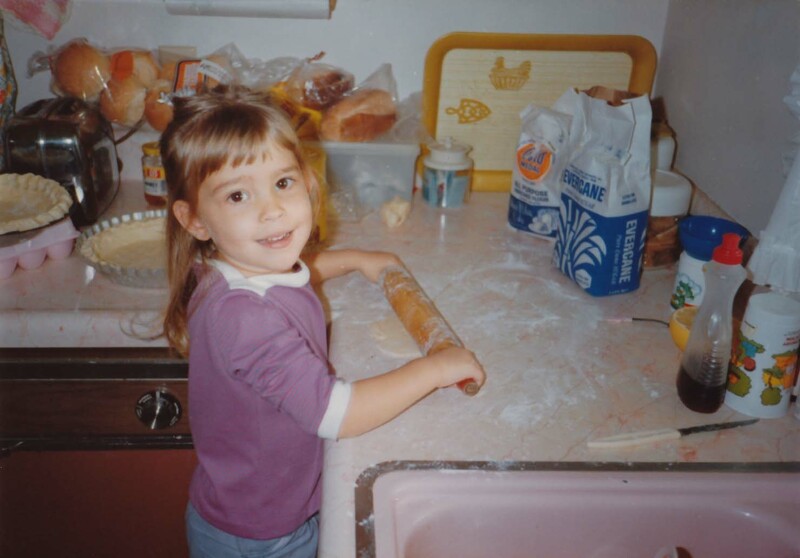 One of my first specialties was crust. More accurately, one of my first acts in the kitchen was fashioning the scrap pie dough into a little amoebae, which I would poke many times with a fork and sprinkle with cinnamon and sugar, to be baked until it became crisp and bubbly. It was a tiny treat that would emerge hissing from the oven, and was meant to be enjoyed as soon as it was cool enough so as not burn our tongues. Not only was it delicious; I had made it. There is pride in cooking, but it is a loving pride, a good pride. No doubt my grandmother felt pride serving a dinner of freshly fried chicken, mashed potatoes, and okra around her Florida table to an adoring family, or preparing her popular potato salad at Big John’s supermarket, where she worked the deli counter in her later years. Her sister, my great-aunt Sophie, must have felt pride as she taught me to make her special pecan sticky buns. Just nine, this is one of the only things I remember from my trip to Iowa – boiling a thick, caramel sugar beside Sophie, in her kitchen that looked out on a never-ending field that filled with rabbits and lightning bugs at the end of the day. Whether or not my own mother felt pride in her cooking is difficult for me to discern, because I felt pride in it. I was mesmerized by her ability to pinch so perfectly the edges of a pie crust, to know when the sauce that would go into her baked macaroni and cheese needed more milk – and just how much more, and the many masterpieces she prepared after work, on weeknights, that nourished and warmed our family. “I can’t understand why people say they can’t cook,” she would often tell me when I was younger. “Anyone can read and follow a recipe.” My mother was, of course correct in her assessment of functional cooking, and as a result I was never under the impression that cooking was something I might not be able to do well. However, what I am beginning to believe my mother did not realize is that she learned to cook with love, and that is something that cannot be located within the measurements and instructions of a recipe. Where does such an inclination come from? When my mother was a young girl in small town Gays Mills, Wisconsin, her parents owned a drug store, and many of my favorite stories from that time are the ones that involve food – of her sneaking spoonfuls of malt powder from the soda fountain counter, going to the local creamery for squeaking-fresh cheese curds, and coming home from school with pockets of mashed potatoes that she couldn’t bear to eat. Perhaps most vividly I can imagine my grandmother rolling a cart of her still-hot homemade doughnuts down the main street to the town factory, where she would sell them for a few cents to the workers each day. I am certain that this was not simply an act of work, but one of giving, one of love. There is certainly value in being a good, capable, skilled cook, however, I would argue there is greater value in being a loving cook. Cooking with love, our personalities come through in unique and unidentifiable ways. I believe this is what accounts for the question of chicken and noodles in our family. It is my favorite of my mother’s dishes, and one that she learned from my grandmother. My aunt also makes chicken and noodles, also of course, having learned it from my grandmother. All using the same recipe, they all produce distinctly different chicken and noodles. All delicious, but all different, and both my mother and aunt will swear that my grandmother’s were better than either of their own. Of course I understand this feeling myself – while I am a novice at chicken and noodles, and therefore cannot even begin to make a claim for them, I have made my mother’s baked macaroni and cheese at least a hundred times. People love it. I love it. But it is not as good as my mothers. She will always tell me it is, but I know that it isn’t. However, I think that she would say I make the best crust, and by crust of course I mean the little cinnamon and sugar amoebae. And that, I would believe, is true.